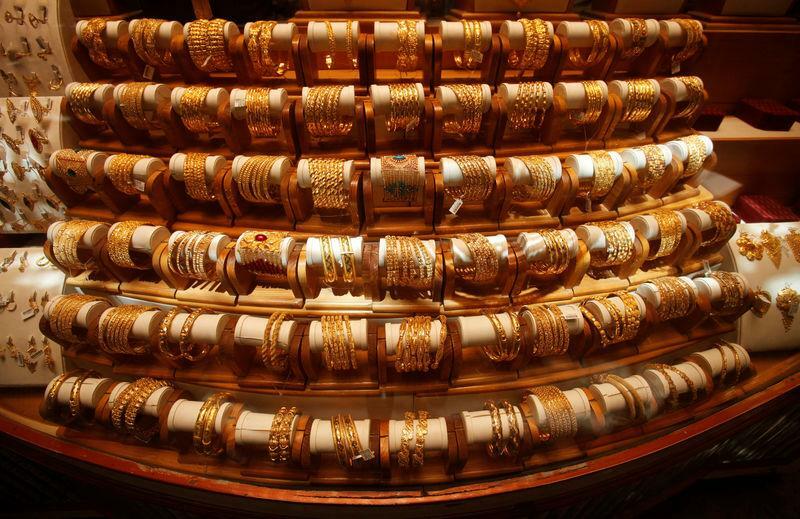 (Reuters) - Gold prices edged higher on Thursday, helped by concerns over the U.S.-China trade dispute and its potential impact on global growth, although gains were capped by a strengthening U.S. dollar. Spot gold rose 0.2 percent to $1,308.18 an ounce at 10:56 am EST (1556 GMT) after touching its lowest since January 29 at $1,302.11. U.S. gold futures were down 0.3 percent at $1,310.10. "There is still a lot of uncertainty in the market and that is keeping gold above $1,300," said Miguel Perez-Santalla, vice president of Heraeus Metal Management in New York, adding that a strong dollar has been keeping bullion from going any higher. "We also have the U.S.-China trade concerns, people are wondering what's really going to happen and today's jobless claims were higher (than expected), which also has gold popping up a little bit." A firmer dollar makes bullion more expensive for holders of other currencies. The dollar index, which tracks the greenback against major currencies, was on course for a sixth session of gains and trading close to a two-week high. U.S. unemployment benefits dropped from near a 1-1/2-year high last week to 234,000, while economists polled by Reuters had forecast claims falling to 221,000. "Uncertainty over U.S.–China trade relations and the potential for another U.S. government shutdown continue to underpin interest toward $1,300 and should see supportive price action remain over the near term," MKS PAMP Group said in a note. Gold rose to its highest since late April last week after the U.S. Federal Reserve kept interest rates steady, but it has since lost ground as the dollar has firmed. While President Donald Trump did not offer much clarity on the trade row in his recent State of the Union address, U.S. Treasury Secretary Steven Mnuchin said on Wednesday that he and other U.S. officials were heading to Beijing next week with the aim of clinching a deal. Mounting global growth worries dragged on equity markets. The extent of the current global slowdown was highlighted after India cut interest rates unexpectedly and data showed Germany's economy slowed in December, strengthening fears of a broader slump in Europe. Gold denominated in euros climbed to a fresh high during the day, hitting its highest since early May 2017, at 1,157.37 euros per ounce. "We believe that gold should remain in good demand – after all, the political risks appear to be increasing again," Commerzbank said in a note. Among other precious metals, palladium gained 1.2 percent to $1,389 an ounce, silver was unchanged at $15.66 and platinum was down 0.9 percent at $795.50 after touching its lowest since January 24.